Such a lovely occasion. - I bet you think this blog is about you. A hotel ballroom steak was cooked medium-rare! I mean, the beautiful wedding. Michael and Michael's wedding yesterday was awesome. I can't believe that I somehow managed to make it through all 12 hours of events. The ceremony was at the Unitarian church, and had far more pomp than I was expecting. With a start time of 2:00, I parked across the street at 1:58 and jumped a gate to literally run to the church, unsure if this would be like Shannon's wedding where the start time was firm. While hurriedly doing that, I noticed there was a horse trailer parked behind the lot on 15th Street. Not something you see in DC, well ... ever. Anyhow, they didn't start until about 2:20 so I was fine. The deacon also got visibly annoyed at the guests for missing an "and also with you" call-and-response. My Christianity is a little rusty. 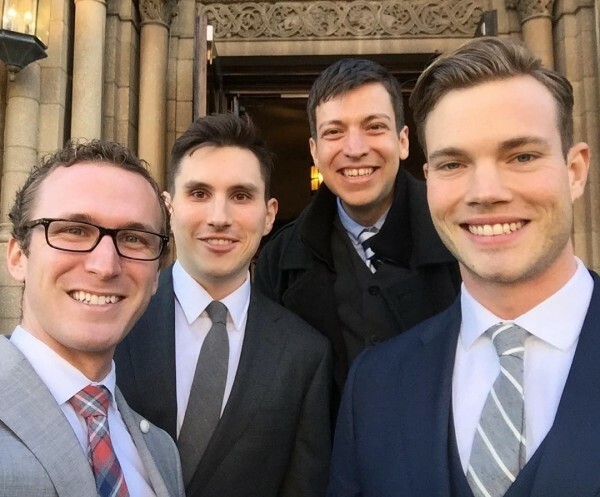 Anyhow, once that was done, the grooms went off on a carriage ride (which explains the horse trailer), I ran into the ancient church basement to use the men's room, and then I took the car home. We still had some time on the clock before the reception, so Chris (who had only eaten almond butter thus far in the day), Josh, Andrew, and I went to Circa for drinks and snacks which was a nice opportunity to catch up. Josh and Chris are going to Finland today! Color me jealous. Josh, Andrew, me, and Chris following the ceremony. The reception was at the Hotel Palomar; we got drinks and awkwardly tried not to pose as the roving photographers (Ben and Brandon) took literal hundreds of photos of the guests. I can only hope they will leave the unflattering ones on the cutting room floor. We then moved into the dinner area, and endured a very awkward emcee welcome "the bridal party." 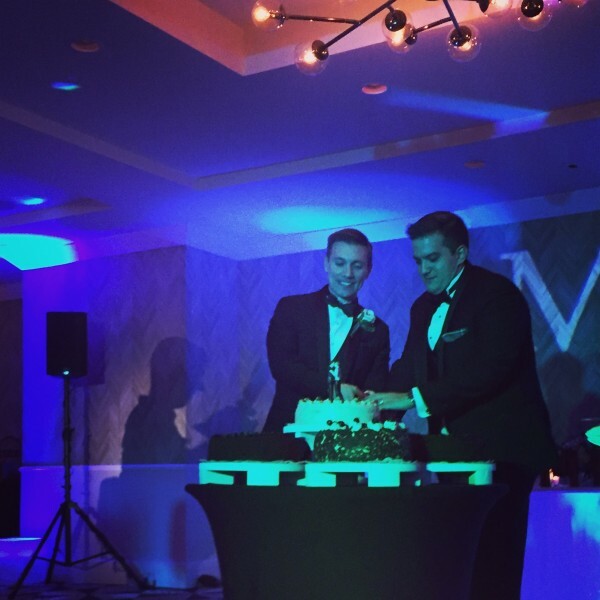 Two grooms + ten groomsmen should = "the wedding party," but who's counting? The food was surprisingly great! First, a pear and endive salad so I can say I've eaten one green thing this weekend. Then my steak was in fact medium-rare, probably made easier by the fact that they were only serving ~85 people. And the folks that got chicken appeared to be pleased too. Then ... dancing. I have never seen that much dancing start so early in a wedding, but there was couple ballad dancing, boisterous group dancing, fraternity brother dancing/throwing people in the air, and generally cheesy wedding dancing. I can't wait to see the photos of that. In between we got to know some of the guests, and continued to partake in the open bar. I basically stuck to beer except for one cocktail and champagne during the (short but hilarious) best man's toast, and that was a good decision. Some Ohio State grads were seated at my table (Michael I. went to OSU), and though they were making fun of me for surreptitiously following the Michigan game in overtime they were doing the same thing. And we won in double overtime! I tried not to be too distracted from the occasion by that, which made me very glad for the existence of Twitter. Michael and Michael cutting their cake. German chocolate. I know you wondered. That whole shebang wrapped at 10, then we sat in the hotel lobby to wait for the grooms and out-of-towners to change, which quickly turned into 10:45. Finally we'd had water and everyone was ready and we walked to Cobalt for the afterparty. First time up there in probably 18 months, but it was actually not too crowded and a nice time. Andrew and I also got to talk to Michael Z. 's sister for the first time, as well as the other gathered lesbians. We left there a little after 1 hungry again, and made a beeline for McDonald's. I got home at 1:45. What a night. 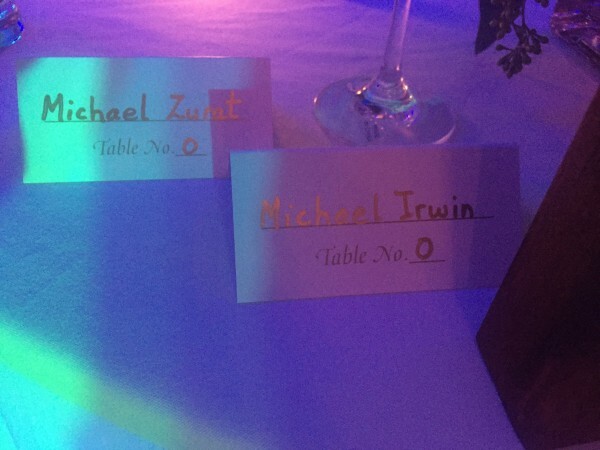 It amuses me to no end that the grooms' table was numbered as 0. It was great, but Sunday was pretty low-energy to recover.